How do you cut an apple? You probably slice it into two parts and then further into vertical quarters, right? Wrong! That's because you probably did not you know of a quicker and smarter way to cut an apple. 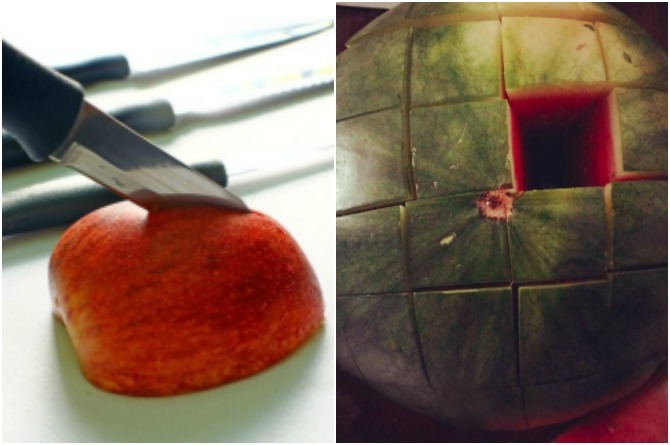 But you are not the only one who is unaware of quick hacks for cutting fruits. 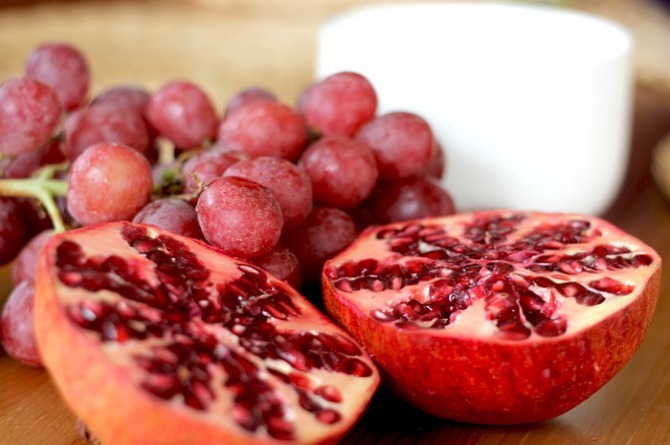 There are many like you who unknowingly put in too much of their time and effort in cutting fruits. But some easy hacks can save both. These hacks can be life savers, especially if you have little kids around who keep you super busy. 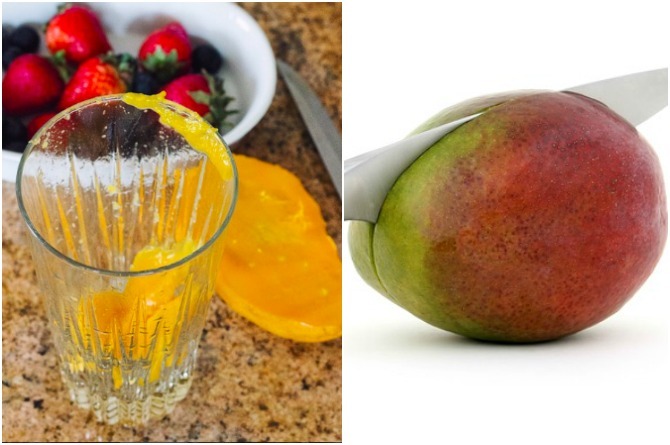 So we curated a list of five basic and simple hacks that you can use to cut fruits in a more smarter and quicker way. Let's begin. Instead of cutting the apple from the middle into two round hemispheres, try to imagine a checked pattern on it. Place the apple face down on the board and cut vertical and horizontal lines. Take a look at how this watermelon is cut, you have to follow a similar pattern on the apple. This way the apple will instantly cut into eight separate slices, and the good thing is that the core will remain intact. 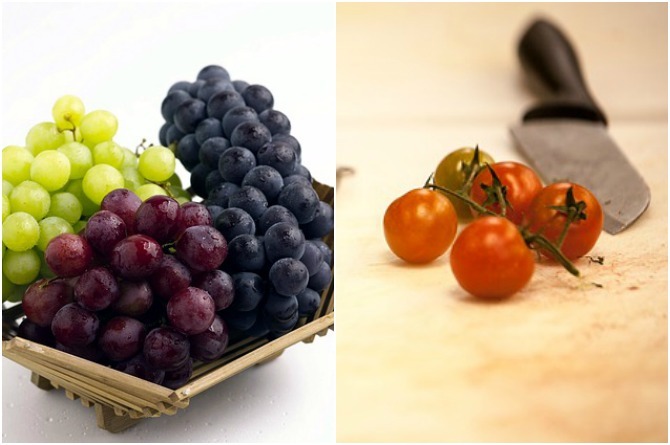 To cut grapes and cherry tomatoes, both of which are tiny pebble like fruits without pits, you can use this simple and effective method. Just place the cherry tomatoes or the grapes between two plain plates. Then take a long blade knife and run it between the plates. This will cut many grapes or cherry tomatoes at once without going at them one-by-one. 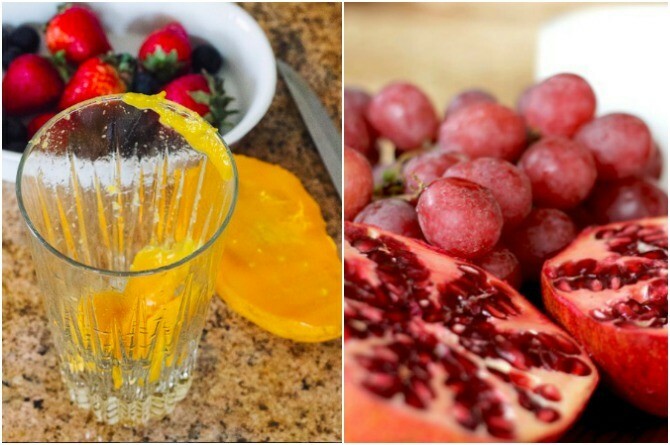 Continue reading to see more quick and easy hacks to cut fruits. Cutting peaches can be tricky and time consuming especially when you have to peel the skin off. 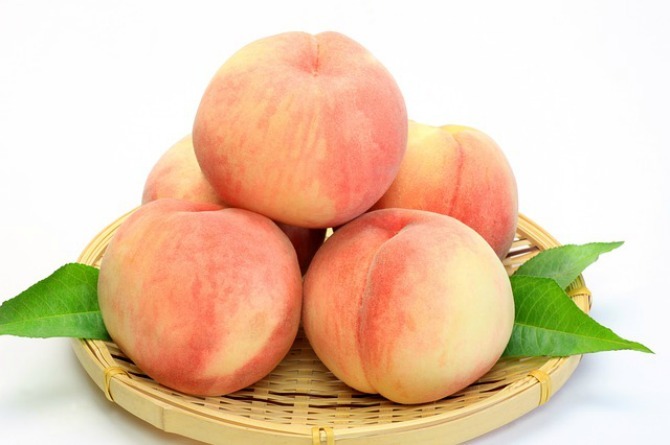 But there is a simpler way to peel the peach without damaging the fruit. Take a paring knife and make an 'X' mark on both the ends of the peach. Then boil some water and add the fruit in it for just a minute. When you take it out, you simply have to peel the skin off and the fruit is ready to be eaten. This can be a tough one if you don't know a short cut. Pomegranates take a lot of time to come out of the shell and then sometimes are almost attached to each other like a bunch and need to be taken out individually with hand. But no more! First, slice the bottom part of the fruit to make it a table top. Now using the same knife, cut small pieces of the skin from the top to bottom. Make sure to not cut very deep and only touch the surface. This should give you six to eight segments, which you can pull apart. Place these segments in a bowl of water and put pressure on the skin so that the seeds automatically get pushed inside the water. The fastest way to cut the 'king of fruits' is not by using knives, but with just a glass and your own hands. That's right. Cutting mangoes can be quite difficult, because the juicy flesh remains attached to the skin leaving most of its juice on the cutting board. But with this easy method, you can cut it within a minute. Slice the mango lengthwise (vertically), away from the pit. This should give you four equal quarters. Now, place each quarter on the rim of the glass in a way that the juicy part is on the inside of the glass and the skin is on the outside of the glass. Using your hand, press against the peel side. This will slice the mango down the rim and you will have the flesh part sitting inside the glass while the skin part remains outside the glass.